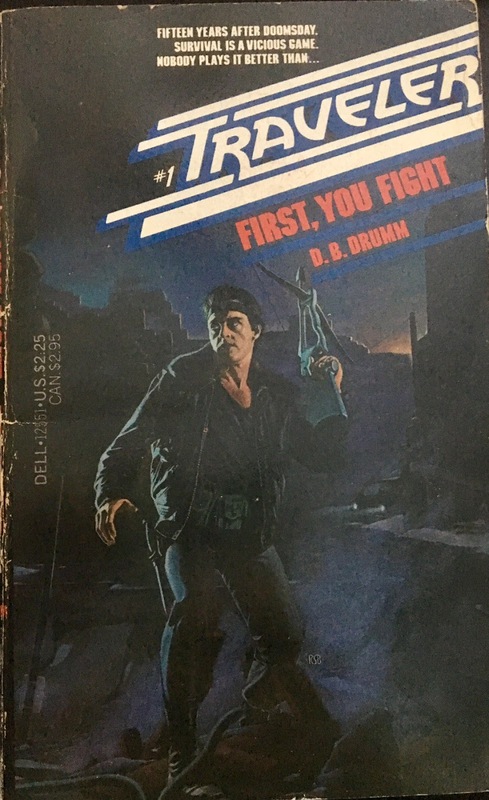 The “Traveler” series was introduced in 1984 by Dell books house name D.B. Drumm, better known by his real name, Ed Naha. Naha wrote the first, seventh and 9-13 volumes. John Shirley took over the account for books 2-6 and 8 and is a household name on the science fiction front…but these sorts of 80s nuked out America stories don’t always make the sci-fi lists at your book store. The book’s cover always brings me a chuckle with it’s obvious similarity to the actor Christopher Walken. We get a ton of cool, macho nachos with descriptions like “Fifteen years after doomsday, survival is a vicious game, nobody plays it better than…THE TRAVELER”. Or how about, “He sells his services to the highest bidder. He kills as easily as he blinks an eye”? I like, “...ever since the Nukes came down, he’s the only hero we got!”. Great stuff to introduce what is actually a very good series thus far. I’m about to start book four but wanted to pause long enough to cover some ground with these first three entries. The series starts with a little history on The Traveler. He’s a special forces guy (aren’t they all) who was admitted into a VA hospital when the bombs fell. The time period of the big one was 1989, and the book fast forwards fifteen years later as our paperback warrior is roaming the wastelands fighting gangs, mutants and what’s left of the government. It’s not a far cry from similar fare like “The Last Ranger” and “Outrider”, so much so that I could misplace The Traveler as Martin Stone. What I love about this series is Shirley’s explanation of why our hero is such a badass. As a covert operative in Latin America, he was unwilfully given an experimental neurotoxin that heightens his senses to extraordinary levels. The downside is that he has to take small supplements of the toxin every few days or he loses his sanity. Thus, the whole point of the story – he drives around (in a fortified van called The Meat Wagon) trying to find the other members of his team so he can remedy them with the toxin. Along the way, he’s searching for Major Vallone, the one responsible for poisoning him. This first entry, “First, You Fight”, sets up all of the above and introduces us to the character. The storyline has been done to death but is brimming with two-fisted action and a fast pace. Traveler finds himself in a modestly rebuilt town that has two warring factions. Each wants to employ Traveler in an effort to secure a firearm supply being ran in by The Glory Boys, a warmonger faction that is now the US military. Along the way he picks up an extra bit of work – freeing a young girl named Allison from slavery. This one is the perfect introduction to the series and certainly sets the stage for a host of sequels. The artwork alone is worth the price of admission (the horror!). If you are in the market for more “The Last Ranger”, “End World” and “Outrider” jazz…this one’s solid.